When you want a compressor larger and faster than a basic one gallon model, the Bosch CET4-20W air compressor is a great choice. The two tanks and 10-second recovery makes this a useful product for those who do a little more work around the house or job site. 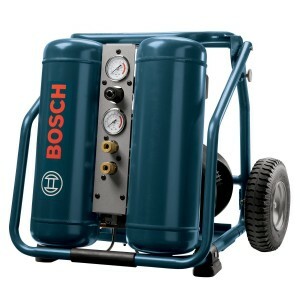 The Bosch CET4-20W is a medium to large air compressor. It is 19 inches tall and weighs almost 85 pounds. It does come with wheels and a comfortable rubberized grip. It is called a hand tank, so it is meant to be very portable. For those who want to tow it around the house might have difficulty lifting it up and down stairs. The tank capacity is 4 gallons, two on either side. The controls are very easy to read in their convenient location between the two tanks. It is also designed with a roll cage for any accident that may happen around the machine. The air compressor has a SCFM of 4.9 at 100 PSI. The motor is rated at 2 horsepower and has a 10 second recovery time and an RPM of 3400. This makes the Bosch very comparable to a compressor such as the DeWalt D55146. 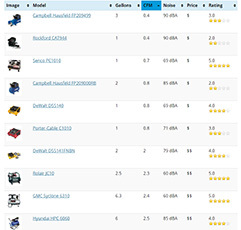 The difference is the Bosch's performance is just slightly lower but it's also a little bit more expensive. The twin vertical tanks make carrying it more balanced. The pump is oil-lubed and is a two pole induction motor. It is easy to maintain, even for those who do not normally work on little motors. The manual is easy to read and you will have no problem taking care of the pump. There is even a little dipstick included so you know exactly how much oil you have left in the tank. It also has an air filter to keep the motor clean. This air compressor is slightly quieter than other compressors. Since all compressors can get loud, it is a good idea to keep your ears protected. The decibel level on most compressors is 90 and this one measures in at 80 decibels. You will be able to have a conversation around this compressor. The compressor is designed for a variety of different users. Because of the weight, it might not be good for those who need to carry it all over the house. If you can roll it, then it is much easier to get to the spot you want. It is also a great product for contractors who are looking for quality product which doesn't require heavy duty demands. The only thing that contractors might not like is that the tires need to be filled; they are not solid tires. So, if you need to drag it over a rugged terrain, the tires could go flat. Finally, the Bosch CET4-20W is a great product for those who want to do carpentry work or even work around the house. This model is not the lightest on the market or the quietest, but it is quite powerful, so it is a good choice for a contractor who needs a reliable air compressor to get their work done properly. The biggest draw back to this machine is the lack of solid wheels. When you are carrying almost 90 pounds, solid wheels would make it a bit easier to use.